Eastern States Men’s Open Revived In Pa.
For years, the Eastern States Men’s Open was a popular tournament in Southeastern Pa., with big prize money on the line. Charlie Fiore, the tournament director, was instrumental in the tournament’s success. He sought out sponsorships and built it to a level that attracted high level players from all over the country. The planning of the tournament was perfect. Players would be in the area for high level tournaments at Aronimink Golf Club and Waynesborough Country Club. Fiore scheduled the Eastern States Men’s Open to start a month prior to the Aronimink Tournament and, with all three tournaments being played on Har-Tru surfaces, it felt like a three-tournament series. Fiore was hospitalized in July of 2013, resulting in the tournament being canceled that year. When Fiore passed away on December 31, 2013, it was a big loss. Another Idle Hour member tried to run the tournament in 2014, but it was not identified as a prize money tournament, and therefore, not a success. In 2015, O’Neill tried his hand at reviving the tournament. Things worked a bit better this time. The tournament ran from July 11-16 and had a draw of 30 men from all over the east coast. The total prize money was $2,800. Punch Maleka, of King of Prussia, Pa., won the tournament in a close final match over fellow South Africa native, Tremayne Mitchell. 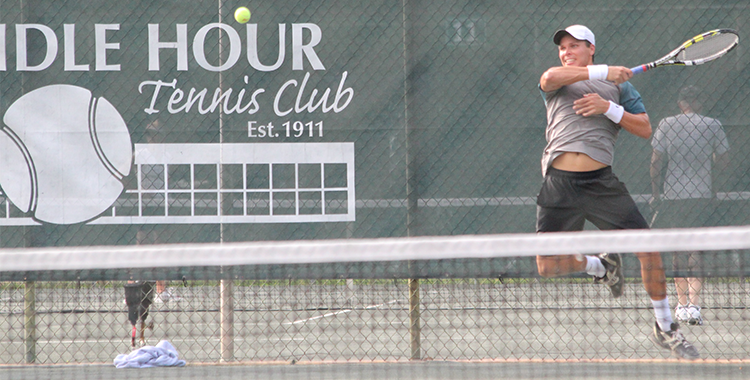 Idle Hour Tennis Club has been around for 105 years. It started in the Millburn area of Philadelphia, before moving out to Drexel Hill in 1928, where it remains today. The club has between 400-500 members who play on Har-Tru courts from mid-April to early-December. In the winter months, they play outside on hard courts. To learn more about Idle Hour Tennis Club, visit the website.